Within the next three years or so, I plan to dramatically increase those amounts. I am currently working on several business deals and hopefully have more on the way. Perhaps one day I will look back at this and laugh how high or low I set my sights. Until that day…I’ll keep charging forward. And when that day comes, I’ll keep charging on. It’s possible to do nothing and get paid. I would know, because it’s my job. I oversee the computer lab on the 5th floor of the Law School Library at the University of Texas. I only work nights when no one is here. –1.) If someone asks for help, I help them. –2.) If someone prints something, I place their printout on a table 4 feet away from the printer. This is a perfect student job because you can get so much work done during work. A really cool boss (But he leaves at 5:00pm, so I never see him). Free use of computers, scanners, DVD burners etc. Average of $260 paycheck every 2 weeks. Have you ever asked yourself if you could fit a full size bike into the trunk of a 2004 Toyota Camry??? Surprisingly, it went straight into my trunk without any problem. I put the back seats down and it slipped right in. Thursday after school, I’ll see how long the four mile ride to campus takes. When I am productive AND physically active during a day, I feel great. I don’t feel good if I’m only productive or only active. -Wake up, class till 2:30pm. -Work on business projects w/ associates away from campus. -6:30pm – leave associates, go to job from 7 till 10:00pm. -Go home, eat my first meal of the day. -Do a little more work, wrap up the day, sleep. While I’ve theoretically been productive all day, I don’t FEEL it. This is because my workouts are not intense enough or long enough these days, they are also late at night. A combination of not eating and entire days spent working on a computer leave me feeling weak and unmotivated at the gym. I’ve got a lot of bus riding and car driving in my schedule now. This needs to stop. I am going to cut out my 4 mile bus rides to campus and start riding a bike (which I need to buy). Going to and from campus everyday will now be an 8 mile roundtrip by bike. This can replace the cardio portion of my workouts. I went to a wedding in Houston this weekend. There I met a friend who recently bought a Mercedes S55 AMG and a Mercedes SL600 (you read right: six hundred). Together these two cars cost well over $200,000. I was tossed the keys to the S55 AMG and I played around in it. It doesn’t matter if you are a lion or a gazelle. There is me, Neville Medhora, and there is Enwon Inc. Type “Enwon” into Google and it suggests searching for “Enron” instead. Yes, I am fully aware there is a phonetic similarity between the two names. Enwon Inc. is a legal entity created to signify the doings of Neville Medhora. I like having a holding company to report earnings under. It may not be completely necessary now, but it will be in the future. I get asked all the time if I recognize the striking resemblence “Enwon” has to the scandal-stricken company “Enron”…yes, and I don’t mind it. 1.) People always take a second-glance at the name. 2.) After that second glance, people NEVER forget the name. I started this site to track my financial life. So far it has done that and then some. Thank you Blog. Sorry I can’t tell you everything right now, all my current ventures are confidential for the time being. My attempt to crash the I C 2 Corporate Governance Conference was very successful. 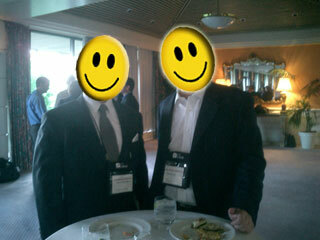 I was tipped off about the conference by “Bob” on Wednesday night. Thursday morning I whipped out my suit and headed over to the Barton Creek Resort and found the conference. Every single person in the room was either a CEO or member of a corporate board….and often times many boards at once. EVERYONE. In fact, “Regular” people weren’t even invited. I purposely showed up 5 minutes late so I could rush in past the registration people. It worked. Everyone had huge nametags around their necks except me…..but it didn’t really cause any problems. I was spotted talking to some prominent figures, so no one questioned me after that. There were LOTS of very prominent figures present, but the most well known was Herb Kelleher, the famous founder of Southwest Airlines. I got to meet, talk and sit next to Herb Kelleher. Not a very clear picture, but that’s Herb speaking. After he was done speaking, he sat down at a mostly empty table. I left my table and went to sit closer to Herb. I snapped this quick video to prove how close I was to him! The rest of the speakers were great, but Herb was the BEST. The conference went from 10:00am till about 7:30pm. It was good food, good drinks, lots of mingling, learning and fun. When I left, I couldn’t tell which car was mine. The Camry or the Mercedes SL500??? Well it’s Friday now. ‘Tis time to party! My stock portfolio has gone into the 5-digit range in the last few days. Here is my portfolio as of Wednesday, 6-8-2005. The main factor in this is Dynegy (DYN). It keeps going up about 3% per day. I went from a 25% loss to a 9% gain in a few days. Also, Thursday morning I will be crashing an exclusive entrepreneurial convention. “Bob” tipped me off that some pretty important people will be attending and speaking. I’ve got my suit ready, a black portfolio, business cards and a fake name tag….lets see if I can pull this off!